Chaetognaths (arrow‐worms) are enigmatic in terms of their phylogenetic position, while the existence of Protosagitta spinosa from the Chengjiang Lagerstätte suggests minimal change in their unique bodyplan since at least the early Cambrian. 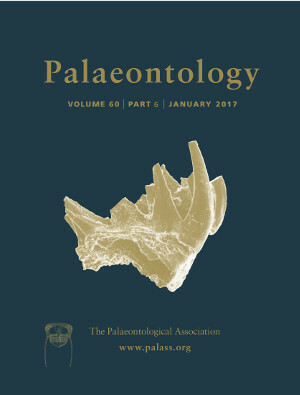 Apart from rare (and sometimes controversial) soft‐bodied remains, the fossil record of chaetognaths is otherwise almost entirely dependent on early Palaeozoic phosphatic microfossils, some of which are placed amongst so‐called protoconodonts. Fused spine clusters are strikingly similar to the cephalic grasping apparatus of extant forms and are assumed to have had a comparable configuration. Here we report a new chaetognath, Ankalodous sericus gen. et sp. nov., coeval with Protosagitta but with a complex feeding apparatus consisting of multiple bundles of recurved spines whose principal function appears to have been grasping. Like all other chaetognaths a predatory mode of life is likely, but its position relative to the sediment–water interface is less certain. Reduction of the feeding apparatus, from the multi‐jawed arrangement of A. sericus to the grasping spines and associated smaller teeth seen in other chaetognaths, was probably a subsequent development and conceivably was linked with a shift to a pelagic mode of life. We also report a new specimen of Protosagitta. This confirms earlier observations but it possesses hitherto unrecognized features, including a cephalic tentacle and fin rays.